These were some of the cars developed by GM in a huge rush after the marketing of all-new long, low and finned cars by Chrysler Corporation in 1957 radically changed the expectations in the marketplace. Given the normally long lead-time to tool up cars, it was miraculous that these cars weren’t delayed until the 1960 model year. 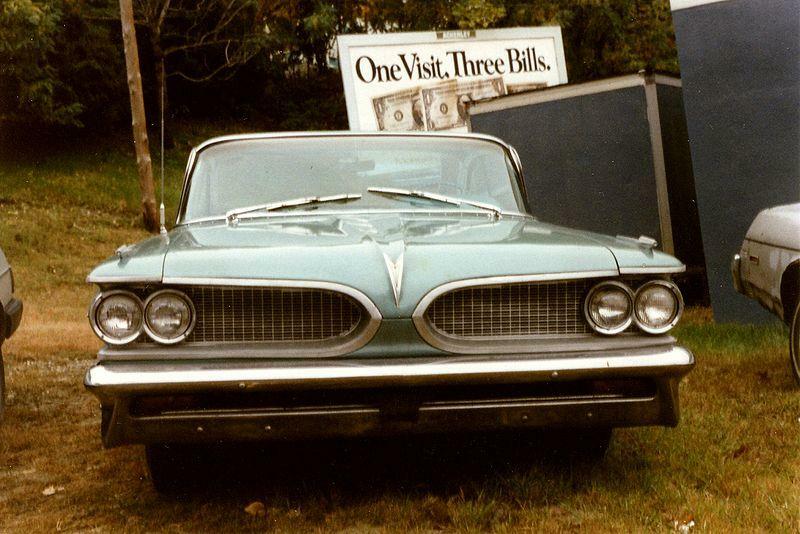 Pontiac had to work with what GM had available, and that meant that like all the other GM Divisions, the only part tooled up and ready to go were the Buick doors which had originally been planned for 1960. All GM Divisions had to style their all-new 1959s around the pieces which had already been developed, but it was hard to tell. The stylists had done a great job of differentiating the bodies, which did span differing wheelbases and used versions of each Division’s own frames and engines. The shared Fisher bodies had rooflines and huge wrap-around windshields which were identical across all GM brands as well. The new 1959 cars were demonstrably lower and longer looking than 1958. The Catalina, named after an island off of California, was a new name for Pontiac and replaced the prior Chieftan line. 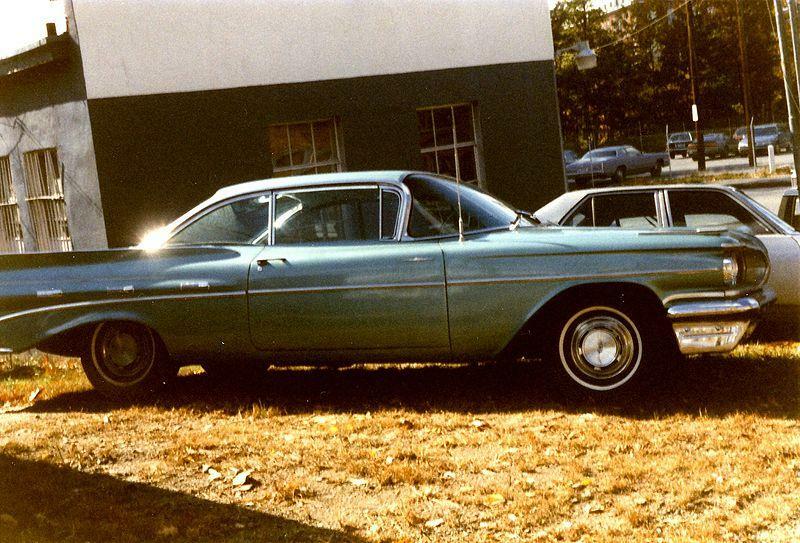 The wheelbase was retained from 1958 at 122 inches, but the span between left and right wheels both front and rear (called the track) was increased in all Pontiacs in the USA and heavily promoted as the “Wide-Track Pontiacs”. The Pontiacs also probably had the most interesting of the 1959 instrument panels in the industry. Hydramatic transmissions were simplified with the loss of the rear pump, meaning no more push-starts for cars with dead batteries. Body styles varied all the way from basic two-door sport sedans (starting at $2,633), four-door sedans, Safari four-door six-passenger wagon, Sport hardtop coupe, Vista hardtop sedan, convertible coupe and Safari four-door nine-passenger wagon. Standard was the newly stroked Pontiac V-8 which now displaced 389 cubic inches (up from 370), with this displacement retained through 1967. The base engine produced as much as 245 hp in the interest of fuel economy, but automatic cars were tuned for 280 hp, with a very detuned 215 hp version optional on automatics only. 300 hp and either 315 or 345 hp Tri-Power engines were optional. In the US, Pontiac (a Division which GM executives were considering dumping in the early 1950’s) moved up from sixth place to fourth place, quite a phenomenal showing. In Canada, Pontiac had reached 82% of Chevrolet’s sales levels. In percentages this sales level was far higher than in the US. For 1960, the cars were restyled with exclusively Pontiac outer panels. An all-new front end got rid of the split grille in lieu of a new somewhat pointed and shaped single grille. American Motors’ Rambler had blown past Pontiac in the sales race because so many customers were moving to more compact cars. In fact, the existence of the mid-priced makes was threatened, and Edsel and DeSoto met their respective demise on either side of the 1960 calendar year. Pontiac soldiered on, comfortably ahead of competitors Dodge, Oldsmobile and Mercury. Middle class folks were buying plenty of cars new in 1959 and 1960, and clearly not everyone was buying compacts. By 1960, a full 77% of Americans owned a car, and 15% actually owned two cars. Folks who have fond memories of these cars or those who just like the style are the most common buyers. Naturally, the convertibles bring big money in top condition, but other body styles remain fairly attainable.